Humpback whales are skilled acrobats, emotive singers and the most ambitious migrators of all mammals. They are also incredibly creative foragers, capable of trying new approaches to catching a meal. 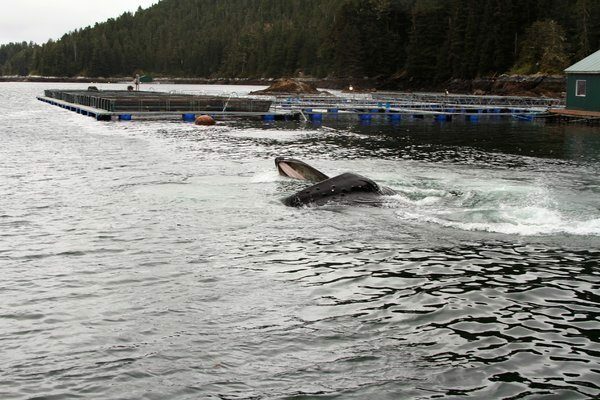 Now, a study has found that these titans of innovation have learned to feed on salmon released from man-made hatcheries in southeast Alaska. “This is a new source of prey, as far as we can tell,” said Ellen Chenoweth, a doctoral candidate at the University of Alaska Fairbanks and lead author of the study, published on Tuesday in the journal Royal Society Open Science. Once nearly hunted to extinction, humpbacks are making a strong comeback in many regions of the world, in part because of their distinct ability to exploit different types of prey. The researchers studied the whales’ dining habits in Alaska in hopes of starting to understand whether they might have an economic impact on the area’s fisheries. Alaska’s modern salmon hatcheries have played an important role in supplementing wild fish stocks since the 1970s. Run by local fishers, the hatcheries rear juvenile salmon until they are ready to be released into the ocean, where they mingle with wild fish before returning to where they were raised. Click here to read full New York Times article.